Stupendous questions from a Sailors Coil to The Big Bang Theory. The Picture Round is on Kids TV Shows and the Wild Card Question is a fine statistic following a certain Mr Panayiotou’s lewd act. Q04. The Sailors Coil, Munter Hitch and a Zeppelin Bend are all types of what? Q15. Which member of The Who wrote the rock musical Tommy? Q22. Which midlands based Football team is famous violinist Nigel Kennedy an avid supporter of? Q37. In The Big Bang Theory at which institute do Sheldon, Leonard, Raj and Howard all work? 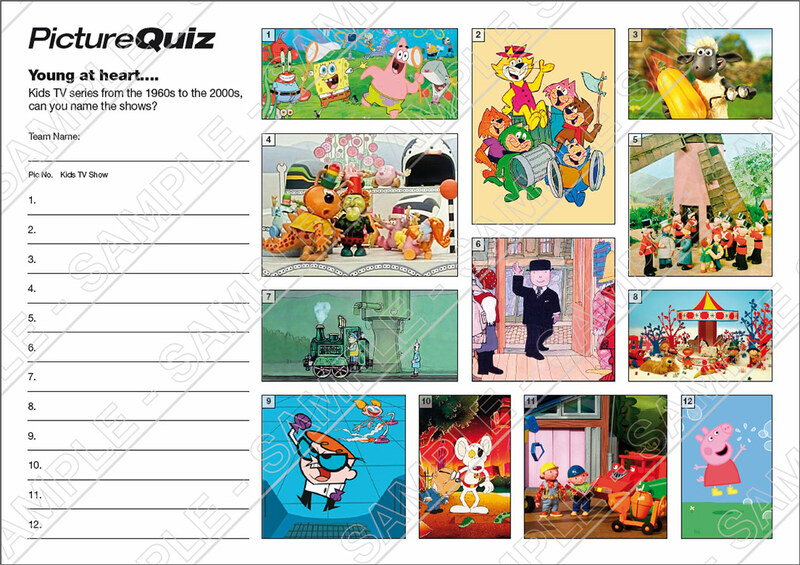 Here’s a low-res sample of the Kids TV Shows Picture Round, click for a higher resolution version. The Picture Round download is a two page high quality PDF with the answers on page 2. Quiz 065s Picture Round might take you back to your childhood… can you name the Kids TV Shows? The Wild Card Question for Quiz 065 is a fine statistic following a certain Mr Panayiotou’s lewd act?